Nucleation in melts happens in spite that thermodynamics for the process of spontaneous formation of crystal areas is prohibited due to influence of surface energy. Formulas for critical size nucleus and frequency of formation as fluctuation over critical nucleus are derived. These formulas can explain great variety observed in nature and industry rates of melts crystallization. A phenomena of spontaneous appearance of crystal phase inside of liquid and then self sustained growth up to the point of complete transformation of this liquid into crystal is the very commonly observed event. For example it happens when one produce water ice cubes in refrigerator. ; In the same time it is startling demonstration of limitations for direct application of thermodynamic laws these described macroscopic processes. An appearance of initial nuclei of crystal as it will be shown later is thermodynamically prohibited but; it happens as statistical fluctuation on the micro scale. where r - radius of crystal nucleus (a presumption of the spherical shape of nucleus is based on the fact that this form provides minimum surface to volume ratio compare to all other three dimensional figures) ΔGv - specific change of free energy per volume, σ - surface energy. Fig 1. 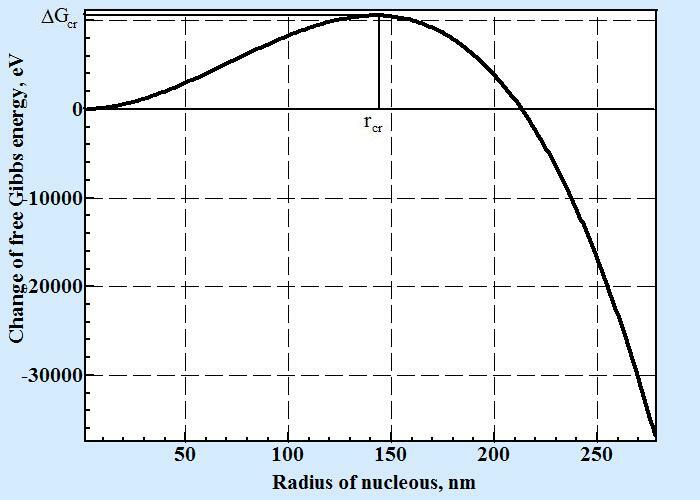 A change of free Gibbs energy depend on radius of nucleus for following parameters: ΔHv = -2×10-28 J/nm3, temperature of liquidus Tl=1500o C, temperature T=1475oC, surface energy σ= 2×10-20 J/nm2. The fact that ΔGv; is positive makes the process of self forming of crystal seed of critical size thermodynamically prohibited closing a patch for transformation from melt into crystalline phase. But experimentally we are seeing such phenomenon. There are some discussion about purity of melt where spontaneous nucleation had happened with the suspicion that actually the formation of initial crystal seed happens on hard alien particles in liquid that can diminish barrier for formation of critical nuclei. But even if such explanation could takes place it will not change the fact of necessity to dodge completely a thermodynamic prohibition for system to increase potential of Gibbs free energy to jump start crystal growth in liquid. The paradox can be resolved by understanding that laws of thermodynamics are applied for only for statistically big systems. Thermodynamic parameters are essentially an average values characterizing behavior of molecules in the system without going to details of the fact of distribution of the values. Very big deviations from average values when locally qualitatively special property can be observed and such deviations are called as fluctuations. In liquid one can on molecular level as a mental exercise of thought experiment to isolate areas where structure of molecules is the same as in crystal. As a result of chaotic movements of molecules these areas can accept additional molecules and emit ones into liquid phase. Each of these crystal like areas is under continuous reversible transformation of its size. Most of such crystal like areas will completely dissolved into liquid. But if time of observation and/or volume of the liquid are large enough by pure chance size of one of these areas will be large then critical. Such over critical area will then stable grow around already with complete accordance with laws of thermodynamics. where k - Boltzmann's constant (1.3806504(24) × 10-23 J K-1), T - absolute (Kelvin scale) temperature. where γo - own frequency of thermal vibration of molecule, Ea - energy of activation barrier to regroup atoms in area represented one molecule from melt to crystal phase. Close analogues to the model of nucleation presented above is a lottery drawing when number of tickets for guarantee win is represented by formula (5) and frequency of drawing is defined as frequency of molecules to jump back and forth over activation barrier. The idea is that if one will buy the ticket for every drawing sometimes in distant future he will win (not necessary more than invest). Parameters in formula (6) can vary their values in extraordinary broad range of values explaining extraordinary variety of experimentally observed behavior of different materials from almost instant crystallization for metals till practical absence of any noticeable crystal formation for centuries for glassware. The principal limitation of the presented model is the contradiction between the premise of established uniformity of temperature as well of stable distribution of crystalline clusters by size. At practice such conditions can be reached, at least with reasonable adjacency, only for specific situations such for example in case of very small liquid drops these have small thermo-inertia that permits to achieve thermal uniformity in very short time. Other complication is related to the fact that as soon first overcritical nucleus starts to expand into neighborhood liquid conditions for formation others are changing particularly diminishing a volume of melt available for formation next overcritical nuclei and increasing temperature due to heat of phase transition.